There’s a magazine article that Mitch Abrahams has always kept from the last big real estate downturn in the late 1980s. In it, Fortune Magazine questioned American real estate mogul Sam Zell on why he was investing in real estate in such a time. Abrahams, a founding partner at Groupe Benvenuto, should know a thing or two about what Zell said. After all, his group is spearheading the Le Peterson condo, an ambitious new high-end condo project set in downtown Montreal, with jealousy-inducing architecture and amenities planned. And he’s doing it after critics say the Montreal market will go flat following its recent upswing in condo construction over the past several years. For Abrahams, his group is offering a luxury condo in a cool part of town, near universities and cultural landmarks in the Quartier des Spectacles, an entertainment district located in the eastern section of Downtown Montreal. He believes it’s enough to peak the interests of buyers. Beyond that, there’s so much more than will set Le Peterson apart from other condo projects in Montreal, like its loft suites with 18-foot ceilings (yes, 18-feet); its 25-floor fitness centre and three-story lounge; its ground floor lounge with a spinning room, bike-repair shop and demonstration kitchen and so on. He doesn’t feel that Montreal is devoid of opportunity after a five-year period of high growth in condo projects. Sure, Abrahams thinks some areas experienced over-development, but nothing massive. He sees real estate as driven by location and a general market, going through different cycles of supply and undersupply. “But I find the montreal market quite good,” he said. Le Peterson is a new project currently under construction offering 250 units from $214 900 to $1.5 million. Interested in your own piece of Le Peterson? The condo experts at McGill Real Estate can help. 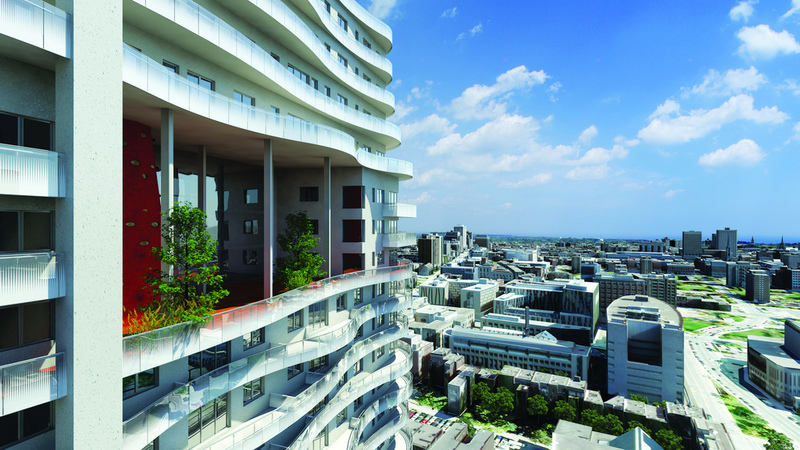 It features incredibly unique architecture with modern amenities, and three different kinds of units: the lofts, with the massive distance between floor and ceiling; the suites, with a huge balcony for each unit; and the penthouses, two or three-bedroom units with panoramic views of the Montreal skyline. From the start, Abrahams wanted to do something that stands out, creating a sort of beacon in the heart of the city. “I like to do projects where people are proud of where they live. This is something that people are excited about,” he said. But there were challenges associated with this project. The lower floors didn’t have the same views as the higher ones. To compensate, the lower 10 floors of the building are the lofts with 18-foot ceilings and mezzanine bedrooms. “That’s a product that’s very hard to find. When you stand in a loft with 18-foot ceilings, it’s incredibly dramatic,” said Abrahams. With the lofts, the challenge was constructing them and still making them feel, well, lofty. Since so many buildings in Old Montreal offer loft spaces, albeit with poorer systems and acoustics. Le Peterson equipped all its lofts with concrete construction, new systems , central air conditioning, cool new kitchens and big windows. Within two weeks of offering the units, three-quarters of them had been snatched up by buyers. Just a dozen units remain today. Ultimately it’s the lifestyle that Abrahams is trying to sell owners on though. When he met with the architects who designed the building, he told them it needed to represent the cultural and entertainment-based spirit of the neighbourhood. “It really is the heart of universities and it’s steps from the financial core on McGill College, and its near the entertainment district,” said Abrahams. “When we saw the site we said this is a really cool location and not enough residential opportunities to let people live in the heart of this vibrancy.” He called it the heart of downtown Montreal living. The amenities planned for Le Peterson follow along this mode of thinking. The ground floor lounge provides a huge space for owners to entertain guests, whether they want to cook a big group dinner in the kitchen or watch the Canadiens game on big-screen TVs. If their friends want to sleep over after a big night, the guest suite will take care of them. Moreover, the ground floor provides a bike repair shop for owners. With Place-Des-Arts metro 50 metres away, there may not be a reason for owners to need a car. And with their own gym practically – a fully-equipped spinning studio – exercise can be done in the building too. “It really is a place to come home after a busy day, relax, unwind, have friends over and build community,” said Abrahams. And boy, do we believe him. Sales center: 445 President-Kennedy Avenue, near De Bleury street.